You will find our current press releases here. Contact us, if you have any questions about our company or our products. CONTA-CLIP further enhances its range of usability aids for VK cabling ducts, adding fast-mount wire holders. The wire holders can be clipped into the cabling ducts without tools. They make it easier to neatly arrange conductors and keep signal and power lines clearly apart. They also simplify adding new wiring, since existing cables stay put and do not come lose and entangled when the cover is removed. Last but not least, users will find it easier to clean their well-organized cabling duct of dust. The wire holders are available in two versions. The DHG type holder has closed spring brackets – cables can be pushed in from above. It comes in three sizes: 34 x 35 mm, 34 x 53 mm and 53 x 75 mm. The DHGB holder, on the other hand, is a small clip that securely holds cable ties of any size. The wire holders are made of RoHS compliant PC and PA. They are suitable for ambient temperatures from -20 °C to +60 °C. CONTA-CLIP adds a transformer terminal for wire cross-sections up to 16 qmm to its TKS series. The terminals are used to adapt coil ends to screw connections to implement power supply of specific devices or machinery in a larger system. Their hinged cover elements open wide and can be fixed in place when opened to enable comfortable, time-saving soldering of the coil ends. 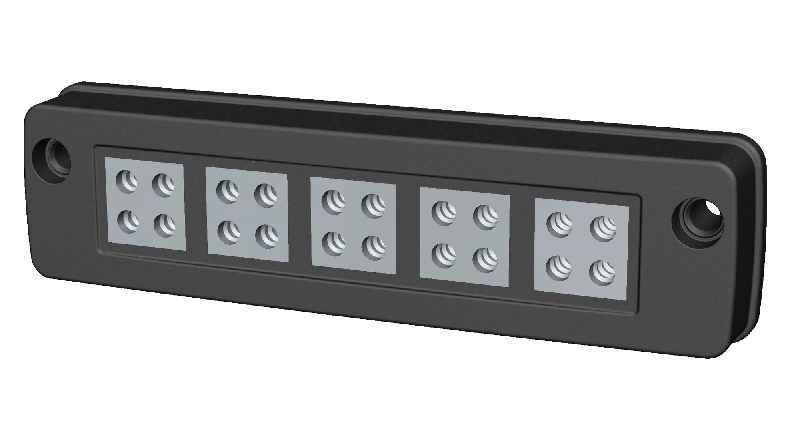 The new, two-pole TKS 16 terminal like all terminals from this series can be mounted directly on a core with integrated receptacles or on aluminum 10 x 2 mm DIN rails. The proven clamping yoke system accomplishes a secure, vibration-resistant connection. The closed housing design ensures touch safety in compliance with DGUV provision 3. 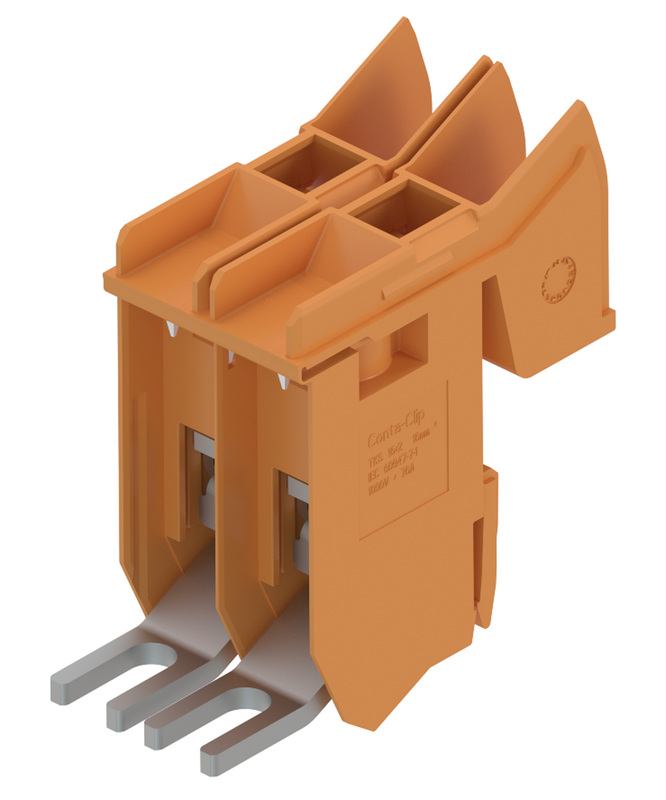 The terminals are available in orange or gray polyamide PA 6.6 UL94 V-0. The PMC SB 7,5 and PC-SB 7,5 quick marking systems are available for labeling the terminals. CONTA-CLIP expands its range of single-level push-in installation terminals, adding the FNT 16 neutral disconnect terminal for wire cross sections between 2.5 qmm and 25 qmm (up to 16 qmm with wire-end ferrules). The push-in connection system allows for safe connection of wires without tools. When a solid wire or ferrule is inserted, the pressure spring opens automatically and establishes a secure contact. Standard screwdrivers can be used to connect and disconnect flexible wires without ferrules. 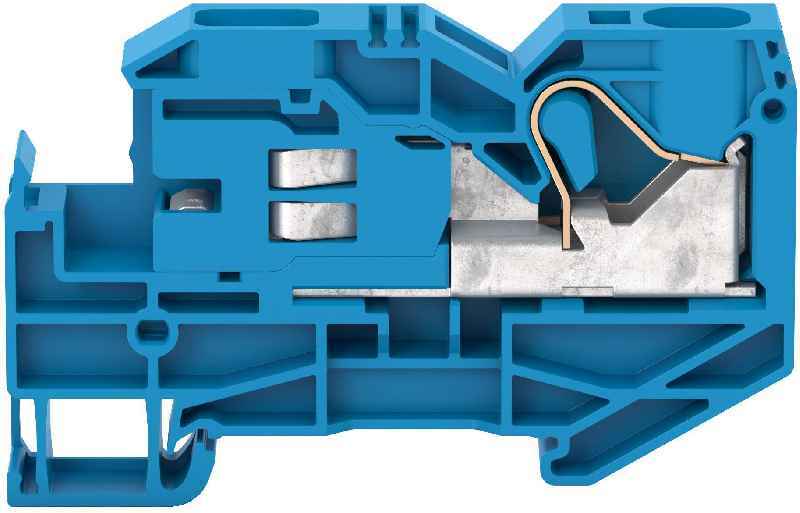 The disconnect terminal integrates a receptacle for the 10x3-mm neutral busbar. There is no need for an additional fixing plate. The neutral busbar is securely connected via a screw-less slider. Like FRKI feed-through terminals and FSLI PE terminals, the neutral disconnect terminals can be used alongside FDLIS three-level installation terminals, because the position of the neutral busbar is identical in both versions. The new FNT 16 neutral disconnect terminal has a contact wire range of 2.5 mm? to 25 mm? CONTA-CLIP continuously expands the KDS-FB flat ribbon cable entry system. 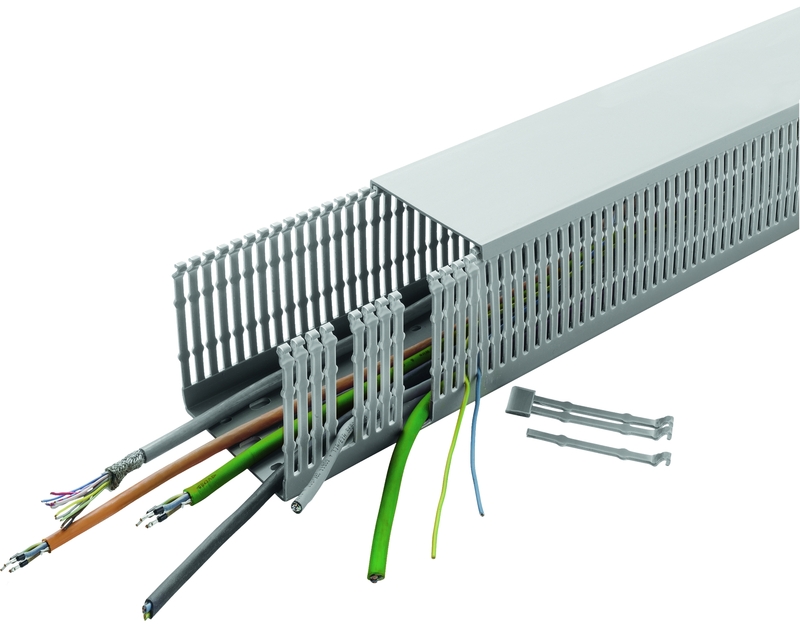 The portfolio currently comprises a total of 13 cable entries with four frame widths and various divisions for flat and round cables. The latest addition is a pre-configured cable entry with five sealing elements to accommodate round cables. The new variant has a 39 mm x 120 mm frame size. 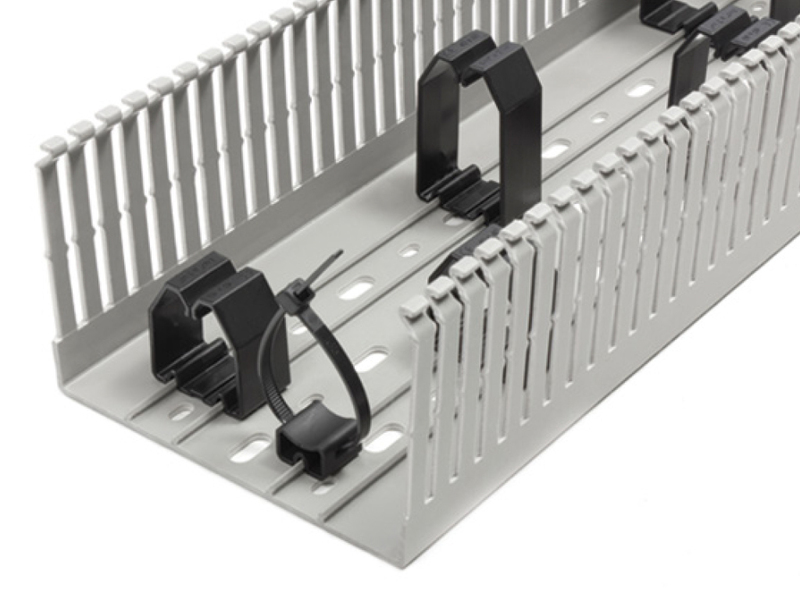 Like all KDSClick cable management solutions, the KDS-FB line is based on a few basic components designed for tool-less assembly and tool-less placement into a frame. 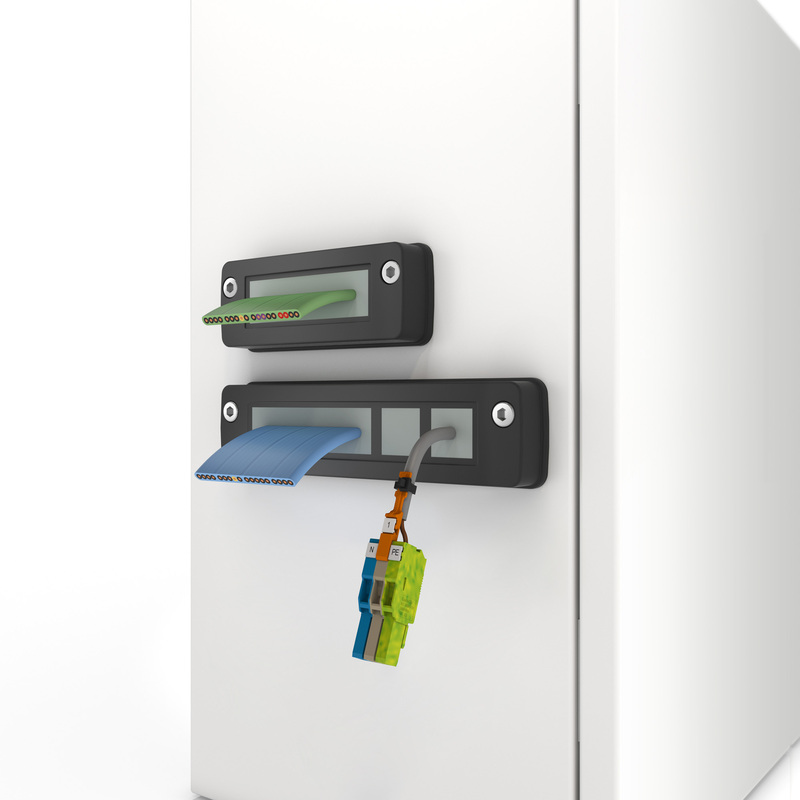 Once the one-piece frame is screwed on the opening from outside the enclosure or distribution cabinet, flat or round cables fitted with suitable sealing elements can simply be pushed in from the inside for a snug insertion into the frame slots. TPE gaskets are molded directly into the frames to ensure high, IP66-rated ingress protection. Sealing elements with gills all around ensure an absolutely tight fit and reliable ingress protection. The gaskets for flat cable entries additionally feature gills in the cable openings. Sealing elements are available for all common industrial cable sizes. KDS-FB thus allows manufacturers to pre-configure machine housings or cabinets for later wiring with no need for advance detailed knowledge of specific end-user requirements. The sealing elements for different cable diameters all have uniform sizes. Due to the easy, tool-less exchange of the sealing elements, the cabling can therefore be changed at any time. CONTA-CLIP offers a wide range of UL- and VDE-certified cabling ducts. These ducts are notable for their excellent form stability. They also feature tight-fitting covers that allow for very easy detachment and reattachment. Pegs with pre-determined breakage points enable comfortable customization of the ducts for incoming and outgoing cabling. The product comes with deburred edges to minimize the risk of injury during assembly and cable fitting and to protect the cable sheathing. The ducts are supplied with a standard length of two meters. They are made from a rigid PVC material that is lead-free, flame-retardant and self-extinguishing according to UL 94 V-0. For use in public buildings, CONTA-CLIP also provides halogen-free versions in accordance with VDE 0472 part 815. In case of a fire, the plastic these cabling ducts are made from does not break down to release toxic gases. Moreover, this material meets the F2 and I3 requirements of the NF F 16-101 railway standards. The product range also includes all the necessary tools for mounting, like, for instance, the VKS cutter for exact 90° angle cuts of cabling ducts up to a width of 125 mm. Another one is the ergonomically shaped SN-SW setting tool that allows for secure, high-speed application of expanding rivets. Its long shaft makes it suitable for placing rivets even in very deep ducts and in other places that are otherwise hard to reach. The VK-AKZ notching pliers can be used to work on the walls of a cabling duct and break off the pegs all the way to the bottom. CONTA-CLIP also supplies miscellaneous accessories such as flexible cabling ducts, coiled tubing, wire holders, support lugs and expanding rivets. Introducing the new KDS-FB cable entry system for flat ribbon cables, CONTA-CLIP expands its KDSClick program of cable management solutions. As is typical for this product range, the system consists of only a few modular components that are easy to assemble without tools. First, the one-piece frame is screwed on the opening from outside the enclosure or distribution cabinet. Next, the cables are pushed through the cable openings of the sealing elements, which are then inserted in the frame slots from the inside. TPE gaskets are molded directly into the frames to ensure high, IP66-rated ingress protection. Sealing elements with gills outside and in the cable openings ensure an absolutely tight fit and reliable ingress protection. CONTA-CLIP provides KDS-FB in four frame widths and with different divisions for flat and round cables. Sealing elements are available for all common industrial cable sizes. The manufacturer has implemented a particularly user-friendly innovation: the sealing element for the smallest cable size is sealed by a membrane. It can therefore also be used as a blanking plug. KDS-FB allows manufacturers to pre-configure machine housings or cabinets for later wiring with no need for advance detailed knowledge of specific end-user requirements. Due to the easy, tool-less exchange of sealing elements, the wiring can be changed at any time.